Do you have good intentions to race the State Champs? Have you registered yet? if you haven’t, you should. It’s way more fun to race than not. Even the time keeper is going to try! Plenty of information to filter through on the dedicated State Champs page – click here – and if you’ve still got questions after carefully examining the page with lawyer eyes, feel free to email timing@ambc.asn.au and we’ll see what ails you. All positions are declared vacant and any positions that have two or more nominations will be put to a vote by club members only. It is much easier to do this if we know in advance. FatChat episode 5 for 2015 has arrived. Well, it arrived on the 15th, but it’s been a busy time. Better late than never though! Head over to the freshly created FatChat page – click here – to get the latest print! 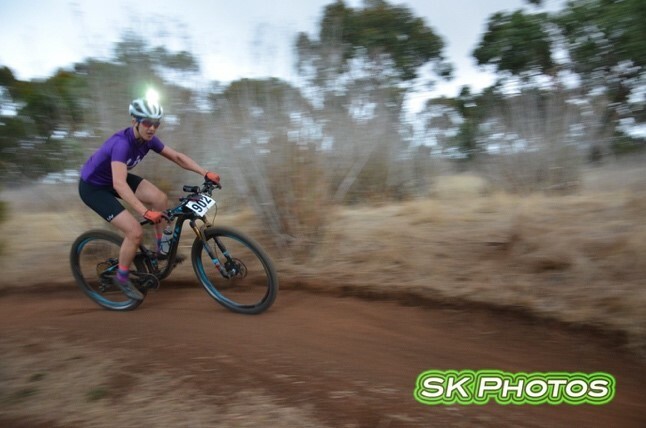 The results page has also been updated with the final Giant XCO round results and the final standings for the Elite Winter Series. Please check over this and if you spot any errors or wish to offer bribes to secure your spot – email timing@ambc.asn.au – and we’ll see what can be arranged. Congratulations to our XC series winners – Tom Goddard and Terri Rhodes – both riders giving strong performances in every race they rode. Prizes will be awarded at the State Champs. Latest edition of Fatchat! is available – See if you can find the common element on each page………. Events wise there’s a little bit happening this weekend. Many local SA riders are off to Melbourne to hurl their CX bikes over barriers and leave tasteful, hypnotic tyre marks in the soil – I think we’ve figured out a new crop circle method! A few other SA folk are off to chase the 100 or so Convicts that got let out in St. Albans, NSW. Good luck to rounding them up swiftly and without punctures. Looking to the future? Well, if you haven’t planned for 4/5 September, here’s a little something that might perk your interest – 6/18 Hours of Melrose hosted by Over The Edge (club sponsor). A fun event that is organised by some of the best reasons MTBers get called “a bit weird”. The weekend away is guaranteed to entertain and if you get bored of the entertainment, Melrose has plentiful amounts of singletrack to distract you. Next club race is at Mt. Torrens on 13th Sep. Check the links below for all your info. What do you call a thieving duck? A robber duck! The next Hammer Nutrition 4 hour enduro is approaching – Sun 31st May. Entries are open and available by clicking here. Links are also available on the Calendar page along with the rest of the AMBC MTB season. Registration will close at 10:am on Saturday 30th May. If you are struggling to get to an electronic device to register in the next week send a quick email (ironic?) to timing@ambc.asn.au or call the club phone. The next round is set to be held at Prospect Hill – directions available here. If you’re interested in lending a hand to your club on the day of the race, then let racevolunteers@ambc.asn.au know in advance so we can plan for it. Free BBQ, drink, and transferable race entry for all volunteers. Track set up. This will occur from 09:30am Saturday 30th May. Contact racedirector@ambc.asn.au to register your interest. Track pack up. Crucial. Unfortunately the arrows don’t decompose and we have to go around pick them all up. We’ve got scientists working on it, but for now it takes good old fashioned humans to go around and pick up the bunting/arrows. Holding down the registration desk. The wind can be a bugger and the more people we have holding onto the paper the more people can sign on to the race and receive their race plate and transponder. The elite winter series table has been formed and is available on the results page. Hammer Nutrition Round 1 and FATCHAT! Yes! The first round of the Hammer Nutrition enduro series is on this weekend. Registration has been open for forever, so if you haven’t got around to that, well, get around to that. Click here to be awesome. If you’re stuggling to be awesome because of reasons – internet is slow, cat GIFs are chewing up your bandwidth or Netflix is finally playing after 4 days of buffering – send an email to timing@ambc.asn.au and we’ll sort something out. We head up to Fox Creek for this round, an excellent prelude to the upcoming Dirty Weekend. So if it’s practice you want, it’s practice you’ll get. Smooth loamy forrests, rocky sections on the crops out yonder and not returning from knolls, all fun times to be had. If you’re after info on the Enduro series – click here. Pretty basic concept – ride for 4 hours and try and beat the person in front of you. If you’re leading, well, good for you. Keep it up. Also the first round of the Elite series. Make sure you get on board if you want to be eligible to win some cold, hard CASSSSHHHHHHHH!!! at the end of the year.